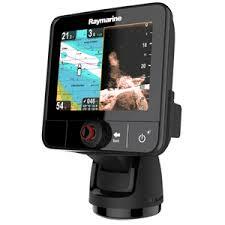 Waypoints 1000 waypoints entered via cursor, lat/lon, range and bearing from present position or at boat’s position. 16 character name can be assigned. Waypoint symbols and groups Additional storage available on CompactFlash cards. 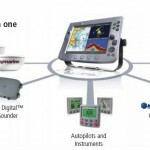 Waypoint Transfer Waypoints database via NMEA and CompactFlash cards. 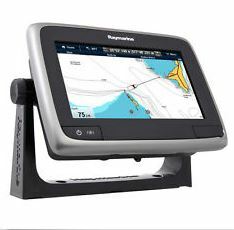 Software also available to convert waypoints to Excel file. Man Overboard (MOB Mode) Mark placed with course line; readout shows range, bearing, lat/lon of MOB and time elapsed since MOB. Screen functions Full, half and quarter screens available dependant on function. Also 3 window page with 2 x 1/4 page windows and 1 x 1/2 page window. 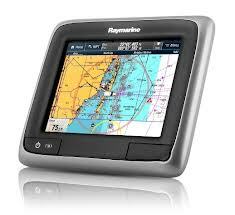 Cartography Navionics Charts on CompactFlash cards Chart of the world built in. Chart scaling 1/32nm (if cartographic detail is available to 4000nm). 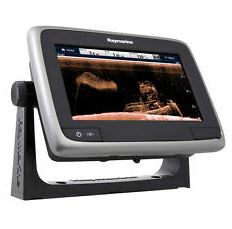 Presentation Modes Head up, Course up or North up (selectable True or Mag-netic). Relative, Autorange or True Motion. Screen offset. 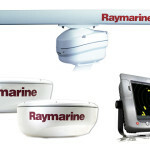 Radar or 3D synchronization. Routes A route plan may contain up to 50 waypoints. Up to100 routes can be stored in the units internal memory. Additional storage available on CompactFlash cards. SmartRoute to create a route from track history. Radar/Chart overlay Radar image can be overlaid on all screen charts. AIS overlay Switch AIS symbols on/off. Display heading/speed vectors and ROT. 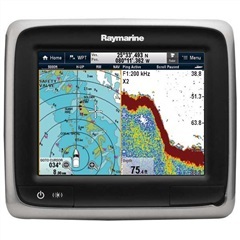 View detailed AIS data, safety critical target data, ALR and SRM messages. Set up a safe zone. 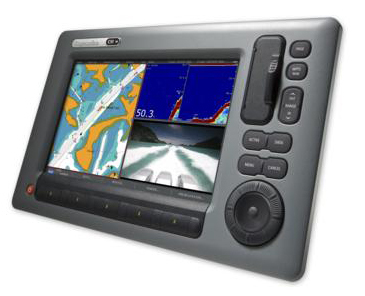 Navigation information Own boats position in lat/lon, XTE, TTG and SOG/COG selectable. Bearing and distance to waypoint. Bearing and distance to cursor and ETA. Range Scales (Range Rings) 1/8 (1/16)nm to 72 (12) nm dependant on scanner Performance limited by scanner type and position. Range Ring Accuracy Better than +/- 1.5% of the max. range scale in use, or 22m (72 ft.), whichever is the greatest. MARPA Manual acquisition of 10 targets, automatic tracking, dangerous target alarms, safe zone, target history, true or rela-tive vectors, CPA graphics and indication of target speed/ course, bearing/ range, CPA and TCPA. 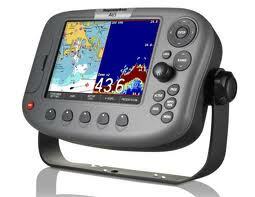 Automatic Tuning Auto control of gain, sea clutter and tune. 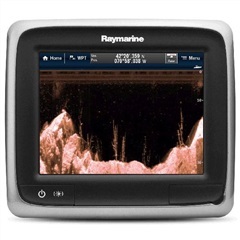 Bottom Coverage Display Shows the diameter of the transducer beam where it meets the bottom. 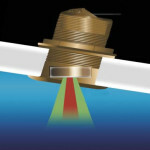 Bottom Lock Displays echoes directly above the bottom. Data Pages 5 pages available. 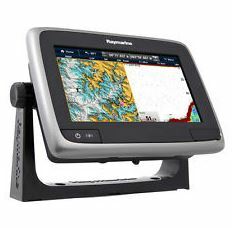 Pre-defined (Navigation, Waypoint, Route, Fishing or Sailing) or user-configured. Engine Pages 5 pages available. Pre-defined (engine, engine and fuel, fuel resources, engine and resources, twin engines or triple engine support) or user-configured. Engine Data available Tacho, boost pressure, alternator, oil pressure, coolant temperature, engine hours, fuel level (tanks 1 & 2), fuel rate, total fuel, load. Weather elements Storm cast, waves, Canadian radar, lightning, wind, sea sur-face temperature, surface observations stations, city weather, NOWRad, storm tracks, surface pressure. Weather reports Tropical statements, marine warnings, marine zone fore-casts, marine watchbox. SIRIUS Satellite Radio When connected to optional SR50 SIRIUS Satellite Radio and Weather Receiver. Subscription required.